What is VET in Schools? Long gone are the days when getting a vocational education meant ‘dropping out’ of school before Year 12. These days, students can complete Vocational Education and Training (VET) studies as part of their senior secondary certificate — an option that is becoming increasingly popular among Year 11 and 12 students looking to combine their studies with something a little more practical. Keep in mind, too, that vocational study is not reserved for trades; students can complete VET qualifications in areas as varied as business administration and veterinary nursing. Student data released by the National Centre for Vocational Education Research (NCVER) this month found that almost a third of Australians aged 15–19 undertook vocational training in 2011 and that numbers are on the rise. Excluding Tasmania, increases were seen in each state and territory between 2010 and 2011. Notably, Victoria saw an increase of almost 15 per cent (around 200,000 extra students between 2010 and 2011). So what are the options for school students interested in adding a vocational spin to their studies? Students can choose to complete VET studies as part of their senior school certificate. In these cases, the VET units may count towards the student’s Australian Tertiary Admissions Rank (ATAR) or Overall Position (OP). If a VET subject is not available at their school, students can enrol at a TAFE or other Registered Training Organisation (RTO) — in some cases, even a neighbouring school. Students who complete VET studies in Years 11 and 12 may be granted Recognition of Prior Learning (RPL) if they choose to progress to higher-level study. These involve students completing an apprenticeship or traineeship part time during their senior secondary studies, with options including anything from carpentry to hairdressing. The latest figures from the National Centre for Vocational Education Research (NCVER) show that school-based training is becoming more and more common, with commencements tripling since 2002. Victorian students also have the choice of the Vocational Certificate of Applied Learning (VCAL) — a hands-on alternative to the VCE. The VCAL program covers four core areas: literacy and numeracy skills, work-related skills, industry-specific skills and personal development skills. Students complete the certificate in Years 11 and 12 and may be awarded a qualification at one of three levels: foundation, intermediate or senior. VCAL students can complete work placements and attend TAFE classes, and may also undertake some VCE-level units. 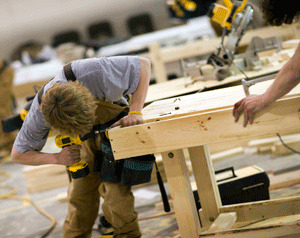 Students in Queensland and Victorian can attend specialised trade colleges that combine traditional academic classes with trade and technical education programs.Students are able to work towards a VET qualification while completing Years 11 and 12. For more information, see Technical education schooling options. NCVER’s Student Outcomes Survey (2011) shows that 93.5 per cent of apprentices and trainees who completed their programs in 2010 found work at the conclusion of their training — a figure that has remained stable over the years. It is also likely that some students within this group, and those that make up the remainder of the figure, were engaged in further study.